We specialise in the supply, installation and relocation of Research Aquatic systems worldwide. We also provide consumables and equipment. As United Kingdom and European Union / EEA Distributor for PENTAIR Aquatic Eco Systems and Aquaponic – Aquaculture products we are able to provide a hassle free supply line of the extensive range of PENTAIR products to support our customers’ installations and organisations. Our no.1 priority is providing you with the best possible customer service and our team is available for support 24 hours a day. Our Aquatic Research Systems offer optimal support and living surroundings to promote animal health. To ensure high quality research environments we supply all parts and fit multi rack habitats tailored to your specific design. To ensure your water is fresh, free from contamination and disease our habitats are built using a wide range of filters and UV sterilization systems. We offer tailored solutions for all your needs and water treatments. If your main focus and concern is the welfare of animals and their health then MBKI is the right company for all your Aquatic Eco Systems. We can provide you with stability and confidence with any research project. 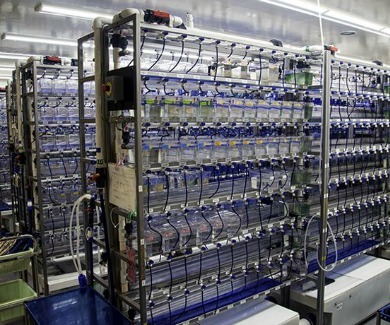 MBKI is recognized as the leading Aquatic Research Habitat manufacture and supplier in the UK. The key to their success is the ability to provide quality systems that produce and maintain perfect sustainable water, critical to animal health and research integrity. With over 17 years experience in design, fabrication and installation of Zebra-fish habitats worldwide, MBKI is second to none. Our Rack Systems are made with stainless steel tubular supports. All the water delivery and drainage systems are easily removable, making maintenance and cleaning a simple procedure. Water flow is carefully monitored and metered by individual valves allowing different flow rates to separate tanks. All of our housing systems come as a stand alone unit or in a multiple rack configuration, giving our customers a wide choice to suit any project. All installations and design work is carried out by our competent team, if you have any questions or queries regarding an installation, a quote, advice or design please don’t hesitate to contact our friendly experts. MBKI has completed Installations all over the world, our Aquatic Eco Systems can be found throughout Europe, middle east, America, Ireland and the UK , no Installation is too far or too big! Contact our sales team to purchase reconditioned stock parts or rack systems. Our friendly team can help you find any part that is needed, or offer advice on all of our aquatic eco systems. All products ordered will be delivered promptly and efficiently. If you require an installation, our team will arrive on your chosen delivery date and endeavour to complete installations on time.